27 May 2015: We have signed a Memorandum of Understanding with the KK Women's and Children's Hospital to explore joint research. 26/27 May 2015: We are participating with our GeoVid technology at the NUSRI Singapore Technology & Enterprise Roadshow 2015 which is held at the NUS Research Institute (NUSRI) in Suzhou, China. 18/19 May 2015: Our group participated in the Cisco ABR Workshop 2015 on Adaptive Media Transport, held in Paris, France. The presentation by Roger Zimmermann was entitled "Geo-Predictive Video Streaming over HTTP in Mobile Environments". 12/13 June 2015: Roger Zimmermann presented an invited talk on "Mobile Videos with Contextual Geo-Properties" at the IEEE International Advance Computing Conference 2015 (IACC), held at B.M.S. College of Engineering, Bangalore, India. 28/29 April 2015: The NUS InnovFest Unbound 2015 was held at the Suntec Convention Centre & Expo in Singapore, presented by NUS Enterprise and AcreWhite. 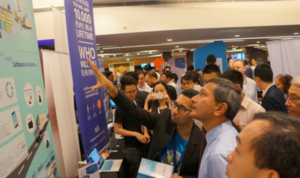 In its sixth year running, InnovFest Unbound 2015 is an event for industry players, entrepreneurs, SMEs, innovators, technology transfer professionals, and government agencies keen on innovation. Sypher Labs Pte Ltd, which has executed an NEAT IP (NUS Easy Access to Technology for Industry Partners) license for our real-time map matching technology, was participating with a booth. As reported by The Business Times, NEAT IP is a new programme by NUS Enterprise to support entrepreneurs and startups in Singapore. Sypher Labs CEO Shamir Rahim described the VersaFleet system to the Minister-in-charge of the Smart Nation Initiative, Dr. Vivian Balakrishnan. More information is available on the School of Computing website here.